Very large contemporary Orb design 18-light chandelier, with a wonderful banded steel central orb and eighteen graceful curved lamp arms mounted on the central band to create a very large diameter chandelier. 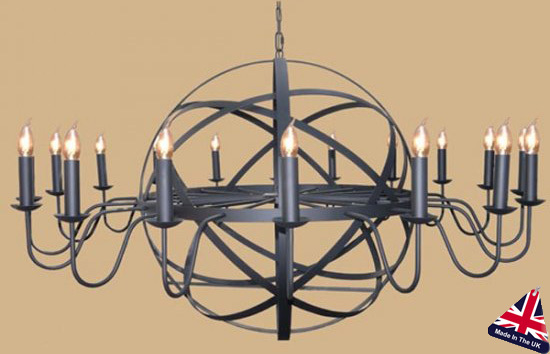 This large and imposing contemporary wrought iron chandelier has a massive diameter of 1500mm and will require a large room to show it at its best. Part of the Archimedes UK made contemporary wrought iron lighting range. Please allow up to four weeks for your light to be crafted and delivered.